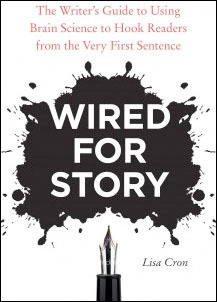 I was intrigued by Wired for Story by Lisa Cron the first time I read the subtitle: The Writer's Guide to Using Brain Science to Hook Readers from the Very First Sentence. Whenever I'm writing fiction, or revising it, I spend plenty of time wondering about that mysterious juncture between what the author intends and the reader receives. If that illusive nexus were easier to understand, then anyone who's ever read a great novel would be able to write one. The book delivers on the promise of this examination, but it does so for a fairly novice writer. Each chapter begins with a cognitive secret and a corresponding story secret. For example, chapter four begins with a Cognitive Secret: Everything we do is goal directed, and our biggest goal is figuring out everyone else's agenda, the better to achieve our own. And the Story Secret: A protagonist without a clear goal has nothing to figure out and nowhere to go. What follows is very solid writing advice, but often of the sort that you will read in many worthy books about story. Often this advice wanders away from the brain theory that supposedly drives the book, i.e. a discussion about body language in chapter three, and a lengthy discussion of the pros and cons of outlining in chapter five. If you are interested in exploring the subconscious brain's reaction to story elements, give Wired for Story a try. Disclosure Statement: I received a free copy of Wired for Story when I expressed interest in reviewing it.